Move your consumer business into new market spaces or technology areas. Think about the future end user. Hypothesize about the wants and needs of three distinct early-adopter groups. Clarify Project Objectives: Identify the innovation area of interest such as the car, the kitchen, or the technology suite of interest. Consider the End User: Compare and contrast the lives and motivations of three VALS™ early-adopter types. Generate Ideas: Facilitate an ideation workshop to identify a wide range of innovation possibilities for each early-adopter type. 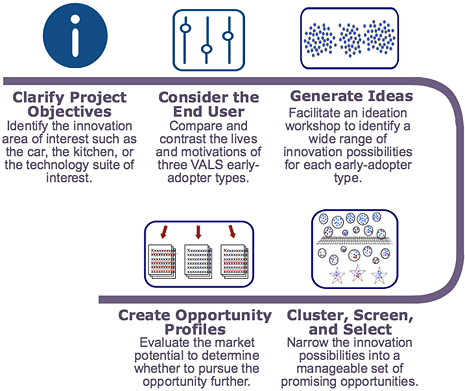 Cluster, Screen, and Select: Narrow the innovation possibilities into a manageable set of promising opportunities. Create Opportunity Profiles: Evaluate the market potential to determine whether to pursue the opportunity further.